* ASC Diaraf could steal the second place from Casa Sport – especially if veteran striker Pape Ciré Dia (born 19.08.1980) maintains his brilliant form. Dia has scored nine league goals this season and has shown everybody that experience is vital in the tough Senegalese league. * ASC La Linguère has played an amazing 17 draws during the season, implying that the club could use a match-winning striker. An interesting player called Ibrahim Dermé has been in great form recently, scoring three league goals in August 2011. I think this is a striker from Burkina Faso but this is not confirmed. Thierno Niang, a very interesting striker who has scored at least three league goals in his debut season, scored for the junior side of ASC La Linguère in the final match of the “Coupes du Sénégal” in late August. This implies that Niang is 16-17 years old. Obviously a player to watch. 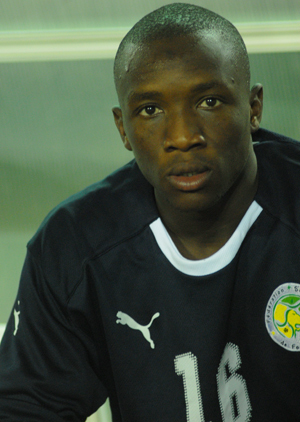 * At 23, central midfielder Moustapha Kassé (born 21.02.1988) deserves a chance in a bigger club then ASC Niary Tally. Kassé, a regular member of the Senegal B national football team, has been brilliant this season. * Moussa Ndiaye (born 20.02.1979), who has participated for the Senegal national football team in the 2002 and 2006 FIFA World Cup is currently captaining AS Douanes. The attacking midfielder / winger is a former player of AS Monaco, CS Sedan, FC Istres, AC Ajaccio, AJ Auxerre (all from France) and Umm-Salal (Qatar). Ndiaye is arguably the biggest star playing in the Ligue 1 2010-2011 and a true hero in his country. Personally, I hope more players from the foreign legion of Senegalese professional footballers went back to Senegal to play for the local clubs. Abdoulaye Sané 3, El Hadji Yaya Sonko 3, Abdou Latif Guenoune 2, Benoit Toupane 2, Mame Birame Gaye 1, Assane Kane 1, Moussa Ndiaye 1, Sidy Ndiaye 1, Own Goals 1. I have a theory that the top striker of GFC, Moustapha Mendy (born 06.05.1986) has scored several of these goals. The goalkeeper of GFC, Pape Diatta Ndiaye, has been a revelation this season and was recently included in the squad of the Senegal U-23 national football team. Based on his performances for the Senegal U-20 national football team, Ndiaye is most likely born in 1989. * Ibrahima Yigo Ba (born 14.10.1991), the defensive midfielder of US Gorée, could very well be a star in the making. Ba experienced relegation with ASC Saloum last season, but his transfer to USG has proven to be an excellent choice. Ba is currently part of the Senegal U-23 national football team. According to the video, Coly is born 19.07.1990, is 178 centimeters and 75 kilos. I have previously referred to Coly as “Demba Coly” but I now think that “Dembo Coly” is the correct name. Together with striking partner Abdoulaye Touré (also at least six league goals), attacking midfielder Jean Remy Bocande and the excellent goalkeeper Ousseynou Ndiaye, Coly has arguably been the most impressive performer of the season for DUC. * Pape Moussa Konaté (born 03.04.1993) of Touré Kounda earned a dream transfer to Maccabi Tel Aviv during the summer and the youngster, who scored three league goals for the newly promoted side, has been on fire since moving to Israel. In July 2011, Konaté scored two goals in the Europa League and in August 2011, Konaté scored two league goals. Personally, I think the success of Konaté implies that the level of football in Senegal is improving and hopefully, several players from the league will follow in the steps of Konaté and join bigger teams. * I was very surprised to read that Mohamed Souleymane Diop of ASC Yakaar had been named as one of the attackers in the squad of the Senegal U-23 national football team for the All-Africa Games. As far as I know, Diop has only been with Yakaar for about three months and I have not read any reviews of the player. Obviously, he has done something right. I won’t be surprised if Mohamed Souleymane Diop has scored some of these goals. * ASC Dahra has been struggling to get goals since they sold they top scorer Abdou Latif Guenoune to AS Douanes. Guenoune scored five league goals before he left. Diouma Top has gotten a lot of chances as center-forward but as far as I know, the talented Top has scored only one league goal. To be honest, there are not many Dahra-players that have caught my eye during the season but their attacking midfielder Fidel Gomis is obviously a quality player. * No teams have scored less goals then CSS Richard-Toll, only 12 goals in 27 matches. Mohamed Cissé (born 29.07.1987), Mamadou Fall, Damao Diatta, Boubacar Toumany Diop (born 30.12.1985) and Alpha Oumar Diallo (born 06.10.1980) are all experienced players who have scored goals in previous seasons but none of these players have impressed in front of goal this season. CSS could very well be relegated as ASC Jeanne d’Arc seems somewhat stronger at this stage of the season. * ASC Jeanne d’Arc, historically one of the biggest teams in Senegal, is working hard to avoid relegation and I personally think they will make it. If so, I won’t be surprised if Moustapha Cissé (born 20.06.1991) could be decisive. Cissé, who played three matches for Norwegian side Løv-Ham Fotball (second level) in 2010, is described as an intelligent, aggressive and physical striker. Cissé, formerly of Renaissance Sportive de Yoff, has scored 2 league goals in about 10 league matches since joining Jeanne d’Arc in April 2011. Experienced performers such as Abdoulaye Badiane (attacker – born 24.12.1986), Pape Diop (striker – born 25.12.1986), Celestin Léon Faye (attacker), Sidath Ndiaye (defender), Daouda Ndiaye (midfielder) and goalkeeper Bity Sy (born 06.08.1987) need to step up during the three remaining matches. The picture is of Bity Sy and is taken from aps.sn. * After winning just three of 28 matches, ASC HLM looks set for relegation. ASC HLM has several players who should be interesting for top clubs in Senegal, including defenders Bakary Coulibaly (born 04.05.1992) and Adiouma Gaye (born 05.12.1992) and attacking midfielder Mbaye Dieng (born 01.02.1991). Hello, I found your blog last year and I think you’ve been doing a great job with it. I’ve been following Ligue 1 for quite some time as well and posting some stuff on my own in a sports forum ( http://s14.zetaboards.com/The_Complex_II/topic/6564075/1/ ) to try and bring more awareness to the league. Keep up the good work, it’s not going unnoticed! I hope JA will stay up this season, looking forward to Monday’s match!